Elk are typically required to be fenced behind an eight foot fence with posts every twenty feet. State and Canadian Province regulations vary across the North American Continent. 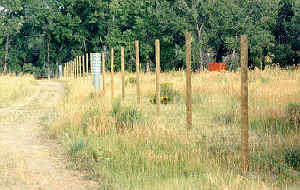 Some states have very minimal regulations and allow ranchers have their elk behind five foot steel pole fences. The elk are quite happy and content as long as they are fed well and treated well. You can compare them with horses, in a way, ...... a horse could jump a four foot fence if the desire was really there, but if you feed it well, keep it healthy and it is not stressed, it will be content to stay behind that small fence for it's whole life. After a few generations, the animals do not even think that they can jump the fence, so they never try. Here is a picture of twelve foot posts, buried between three and four feet, with fence ready to be installed. The fence is manufactured by different companies and comes in different heights and stay distances. This wire is eight foot high with 6-inch stays. The roll is approximately 330 feet long and weighs over 300 pounds. You can unroll it on the ground and then as you tighten it, with fence stretchers, the fence will stand itself up. Special fencing tools are required because this is such a special type of fence to install (High Tensile). You can also make a large spinning ginny that will attach to your tractor. The spinning ginny takes less man power, so I prefer that method. You must use fence stretcher bars to pinch the fence so when you tighten it the fence tightening will be even. You will need to also use chain-walkers to pull the stretcher bars because trying to pull it with the tractor, truck, or come-along will not get it tight enough. I have seen many 12-ton come-along broken during this tightening and highly recommend the chain-walkers. This picture shows the elk standing in the 30 foot wide raceway. This raceway leads from the pastures and into a crowding pen (large enclosed area, around 50'x50', plus or minus). The 12 foot raceway leads off the crowding pen and towards the squeeze. This 30 foot raceway is wide enough that the elk have no fear to enter and feed and thereby get caught, or if the elk are being pushed they will not become so stressed. 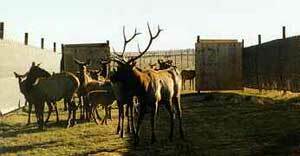 Many ranches are set either to trick the elk into an enclosed area, with feed, or to push them into an enclosed area. Pushing is a more desirable method since the enticement with feed sometimes will not work during the lush spring or summer months. This is a picture of the 12 foot wide raceway prior to the squeeze, for the outdoor system. Note the 180° turn into the squeeze. so the elk feel they are getting away from the pursuer. There is a walkway around the outside of the raceway for moving the elk forward....this allows the operator to be above the elk and not in with them. There are some intermittent slide gates down this 12-foot raceway so the elk cannot backup and the quarters keep getting smaller and smaller to segregate the elk down to smaller groups. Once the larger group (twenty plus or minus) has been divided out into smaller groups, the first small group enters then final section that leads up to the squeeze. This small section is only around 30"-36" wide and six feet long, if this area is too big the animals can turn around in it. Because this section is so narrow, it will not be big enough for velveting bulls. If you are planning on velveting with the same squeeze you test and inoculate with then you will need to look at the newer model squeeze designed for velveting and testing/inoculations because it gives more area and it is less likely that the velvet will not be harmed. After the squeeze is a directional gate for isolating the animal(s) or to move the animal(s) back into the raceway/pasture. Some ranchers feel that a raceway above the animals does not allow the animals to work well (my belief is more regarding what the elk are accustomed to using and the person(s) running the elk). 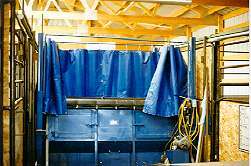 Some ranchers would prefer a gated system comprised of 5'x5' stalls, end to end, set up in a rectangular or square manner. Then you push the animals from stall to stall and separate them as needed. The inner area is used as the working area and the squeeze is typically set up near an exit. NOTE: See the squeeze at the end of the last section on the left. Also note the covers on the last sections so the elk feel more closed in and will not try to go up over the plywood or will not try to turn around when being pushed from below. 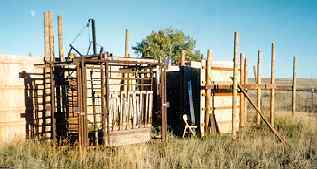 This picture is a modified cattle squeeze, manually operable, for working the elk. 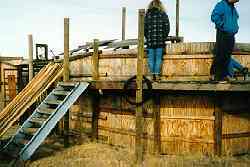 The raceway feeds into the squeeze with two compartments prior to it (shown under construction). 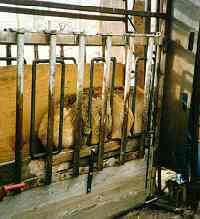 The first compartment is to prepare the next animal and the second is to weigh the animal. The ranch that uses this can work one female on the average of one every four minutes and one male on the average of one every six minutes (The veterinarian with a husband and wife team). There is a neck squeeze to hold the animal from jumping around and then a body squeeze to hold the animal down so injections and testing can be performed. You will need to cover the animals eyes as quickly as possible since the darkness settles them down. Some breeders work animals entirely indoors for the pleasure of being out of the elements, out of the mud, and it calms the elk down once they are more concealed in. Cow in modified manual elk squeeze. This portion immobilizes the body. There are lower and upper adjustments. This portion immobilizes the head. and the green ear from just being tattooed. Many squeezes are now available through a multitude of sources. The hydraulic squeeze shown to the right is part of an indoor system. This squeeze will catch the elk, squeeze in on the elk (the sides have padding) and then lift the elk off the ground to immobilize them. The head is above the upper part of the squeeze to allow testing/inoculation or velveting.